A fire tore through a karaoke lounge in southern China on Tuesday, killing 18 people and injuring another five, as authorities arrested an arson suspect who had reportedly blocked the entrance with a motorcycle. The fire started after midnight in a three-storey building in Yingde, a town within Qingyuan City in Guangdong province, and was put out shortly before 1:00 am local time, according to the police. The suspect got into an argument, then used a motorcycle to block the building's door and lit the fire, state broadcaster CCTV said, adding that he was on the lam. Unverified videos from the scene posted by local media show flames leaping from the building on a tree-lined street at night, with fire trucks and a crowd of onlookers on the road. Karaoke is a popular activity in China, with even shopping centres featuring booths where people can sit and sing their favourite songs. Merrymakers often go for a buffet dinner and sing and drink with a small group of friends in the private rooms late into the night. In the days following the accident, China's top safety watchdog said the facility had poorly-designed fire exits, while safety checks, fire and electricity management, and the emergency response system were all found lacking. More than two dozen people were killed in two fires in Beijing's migrant neighbourhoods late last year. The first blaze, which killed 19 people in November, prompted authorities to begin tearing down unsafe buildings in the capital, driving hundreds of thousands of down on their luck residents out in the middle of winter. 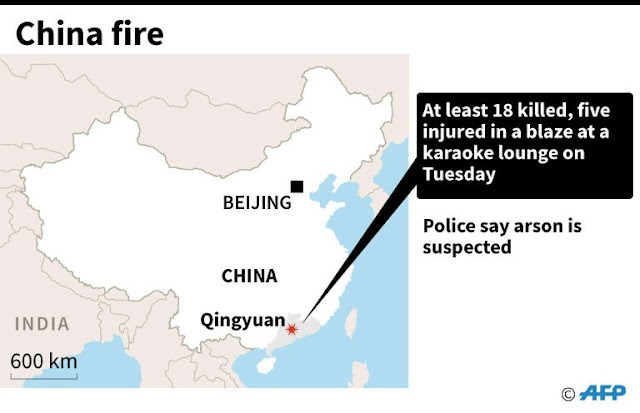 0 Response to "18 dead in China karaoke lounge fire, arson suspect detained"